Which Tree is Right For You? | Mr. Tree, Inc.
Ready to plant a tree, but not quite sure where to start? There are a variety of tree species that will enhance your front yard landscaping. From ornamental trees to shade trees to everything in-between, there are virtually limitless possibilities for your front lawn. Mr. Tree specializes in family tree service and we’ll help you figure out which tree is right for you and your home. The first thing you want to do is consider why you’re planting the tree in the first place. Determining what purpose you want the tree to fulfill will help you to determine what type of tree to plant. 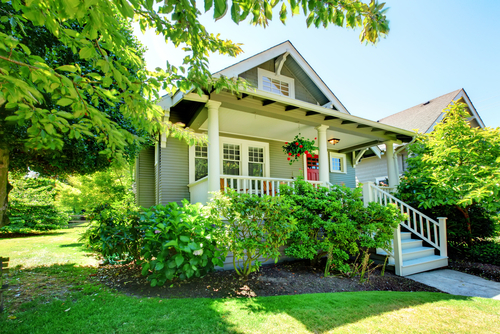 For instance, perhaps you want to enhance your home’s curbside appeal. Maybe you’re planning to sell in a few years and you want to add to your home’s overall property value. In that case, an ornamental tree would suit you well. Ornamental trees usually only grow to about 25 feet, so they likely won’t provide much shade. Instead, ornamental trees will brighten your yard and provide a beautiful focal point for your front lawn. Many flowering trees only bloom for a couple of months out of the year, so you should take that into consideration when selecting which type of ornamental tree to plant. The Japanese flowering cherry tree, for instance, will add a great aesthetic to your yard with its white-pink flowers and slight fragrance. However, these trees only bloom March through April. Similarly, the dogwood tree has been used as an ornamental tree for centuries and is a popular choice for family tree service landscaping. Dogwood trees come in a variety of types and colors, including white, pink, and red so you have a wide selection in deciding which color would best enhance your home’s front lawn. The pink dogwood tree blossoms in springtime and also produces beautiful red foliage in the fall. The white dogwood tree also produces springtime flowers and a red-purple color in fall. Another excellent choice for a flowering ornamental tree is the crabapple tree. The flowering crabapple tree will enhance your front lawn with its dark pink and red blossoms in April and May, but its foliage can be enjoyed for most of the year. Its foliage is a purplish-red in the springtime, dark green in the summertime, and bronze during the fall. While flowering ornamental trees can add to the beauty of your home’s landscaping, there are several other purposes for planting a tree in your front lawn. If you enjoy spending time outdoors, you may want to plant a shade tree to provide cover during hot summer months. But which one would work best for your home? As your family tree service experts, Mr. Tree is here to help determine which shade tree will suit your needs. There are many types of oak trees that provide excellent relief from the sun’s harsh glare. The bur oak tree can grow up to 80 feet and also has a spread of 80 feet, so you’ll want to make sure you have adequate space to accommodate it. The bur oak can be grown in plant hardiness zone 8. The scarlet oak is a fast-growing shade tree that can be grown in plant hardiness zones 8 and 9. It also grows up to 80 feet, but its spread is typically 50 feet max. An added bonus is that the scarlet oak also produces a beautiful scarlet red color in fall. The northern red oak is another fast-growing shade tree that produces a beautiful red fall color. It can be grown in plant hardiness zone 8 and features a spread up to 45 feet. The sugar maple tree is another shade tree that will provide a canopy for you to relax under on a hot summer day while adding some warmth and color to your yard during the fall. Its beautiful fall foliage features outstanding shades of yellow, orange, and red. The sugar maple can grow up to 75 feet high with a spread of 45 feet and can be planted in hardiness zone 8. Instead of shade, maybe you’re looking for a little privacy? In that case, you may want to plant narrow evergreen shrub hedges. The Korean boxwood can be grown in both zones 8 and 9. The shrubs are great at providing privacy because of their dense foliage that lasts year-round. Likewise, the north privet has dense, dark green foliage and can easily be sheared into precise shapes. It is also considered an ornamental shrub because of its aesthetic value. This shrub can be grown in hardiness zone 8. If you’re looking to plant a fruit tree instead, apple or peach trees would work best in Portland. There are several different types from which you can choose. The red delicious apple tree grows in zone 8. The apples can be picked directly from the tree and eaten fresh, or saved for baking a sweet apple pie. If you prefer green apples, the early harvest apple tree can be grown in zone 8 as well. Those who live in plant hardiness zone 9 and wish to plant a fruit tree should opt for a peach tree. Luckily, America’s most popular peach tree, the Elberta peach tree, grows in zone 9. The tree has beautiful flowers that bloom in the spring and large peaches that typically ripen in the summer. Elberta peach trees are great for fresh eating or making desserts or jam. If you reside in zone 8, you’ll have more options for peach tree planting. The golden jubilee peach, the hale-haven peach, and the belle of Georgia peach trees are all great choices. The latter produces splendid red flowers and large fruit with intense flavor. The hale-haven peach tree is significant for its high-yielding qualities. The golden jubilee peach also produces high yields of fruit that are excellent for making preserves. Have a better idea of what type of tree you want to plant? Maybe you’re looking to plant a variety of trees that serve different purposes. Whatever your plans may be, Mr. Tree is here to help you improve your home’s landscaping. We specialize in family tree service and will help you find the right tree to service your family’s needs.